Webpage created: February 23, 2016. Devonport Royal Dockyard Orphanage, Milehouse. Founded in 1849 as the Dockyard Female Orphanage, to maintain, clothe and educate orphan female children of Royal Dockyard workers who had contributed to its funds, it was originally located in Morice Square. Orphaned boys were admitted from 1900 but this required a building with a larger amount of accommodation. Upon a site at Milehouse, on the main road to Tavistock, granted freely by the Lord of the Manor, Lord Saint Levan, Lady Sturgess Jackson, the wife Vice-Admiral Sir Thomas Sturgess Jackson KCVO, the Admiral-Superintendent of the Royal Dockyard, laid the foundation stone on Saturday June 21st 1902. Eight other memorial stones were then laid by Mrs J B Huddy, lady president 1886-1892; Mrs G Crocker, lady president 1892-1895; Mrs H R Champness, lady president 1897, on behalf of the Chief Constructor's Department; Miss Highton, on behalf of the Chief Engineer's Department; Mrs W J Clarke, for the Superintendent Civil Engineer's Department; Miss E de Ridder, for the Naval Store Department; Mrs Dexter, on behalf of the Expenses Account Department; and Mrs R N Ommanney, on behalf of the Staff Captain's Department. A purse containing £247 was placed on the foundation stone, the result of a recent collection among the men of the Royal Dockyard. Others present at the ceremony were the Mayor and Mayoress of Devonport, Mr & Mrs E M Leest; Mr S W Wright, the orphanage's secretary; Mr R Cerutty, the assistant treasurer on behalf of the treasurer, Mr T J A Byfield, who was unable to be present; the Reverend F C Stebbing, the Dockyard chaplain; the Dockyard Chapel choir; and Mr G Hele, at the harmonium, who presided over the whole event. It was regretted that Lord Saint Levan could not be present. Mr Snell, a local architect, designed the new building and this was opened by Mrs Henderson, the wife of Rear-Admiral W H Henderson, the Admiral-Superintendent of the Royal Dockyard, on Saturday July 4th 1903. As a result, 25 boys and 25 girls could now be admitted to the orphanage, compared to only 22 in total before. The building had a frontage of some 60 feet while the whole site extended some 120 feet from the road. On the ground floor were the dining rooms, a board room, reception room, matron's room, kitchen, lavatories and scullery. On the first floor was the matron's bedroom plus dormitories for 25 girls, along with wardrobes, lavatories, bathrooms and an isolation room. The accommodation for the boys and master were on the second floor. Mr and Mrs Cubbins were the master and matron. Upon the outbreak of the Second World War, the Orphanage moved out of the City, to Mary Tavy, north of Tavistock. 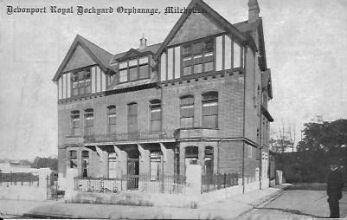 Their premises at Milehouse were purchased by Plymouth City Council and converted into one of what the National Assistance Act 1948 termed 'guest houses for old people'. It housed 25 men. The building still survives but has now been converted into private apartments.